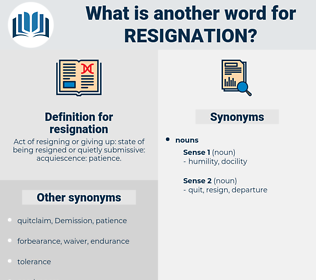 What is another word for resignation? Act of resigning or giving up: state of being resigned or quietly submissive: acquiescence: patience. dismissal, renouncement, relinquishment, renunciation, abandonment, subordination, cancellation. nonconformity, fight, disobedience, arrogance, pride, disagreement, refusal. resistance, agreement, stay, impatience, intolerance, taking on. As soon as we get back, I'll make out my report, and send my resignation with it back on the first ship to Earth. The man who had spoken made a little gesture of resignation. regimentation, recantation, reexamination, recommendation, Rocky Mountain, richmondena, recognition, recondition, rogue nation. 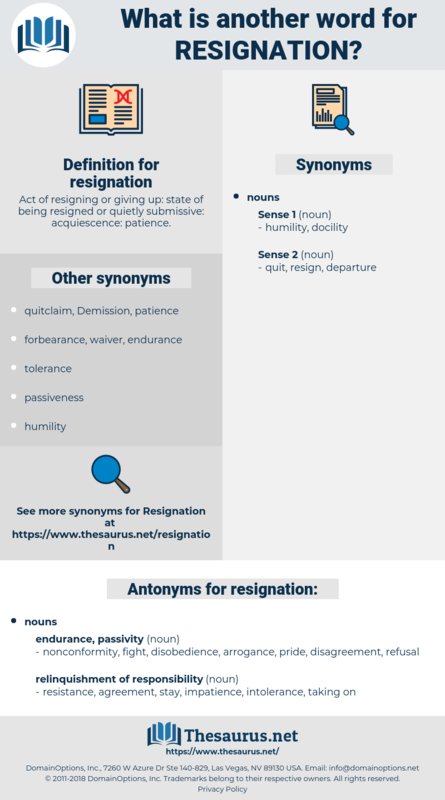 renunciation, stepping down, abdication, renouncement. speech act, written document, document, papers.